My membership is in Highpoint Baptist Church of Wolcott, Connecticut. I only study from, preach from and quote from the King James Bible. The King James Bible is the best and most trustworthy English translation available. It is an excellent and true translation of the Textus Receptus Greek Text and Masoretic Hebrew Text. God has preserved His Word for every generation through these writings. The KJV (1611) is God's Word without error or need of correction. What size churches do you hold meetings in? The size of the church is not a matter for a meeting. No church is too small. Any size church that believes the Bible and can agree to my doctrinal statement can have a meeting. I have had meetings in basements with just a handful of people and in buildings with hundreds. What are your financial requirements for a meeting? I have none. I live by faith and leave all financial considerations to the church. I do not have a fee or demand travel expenses. These are best left for the church to consider. I put the matter of finances in the hands of the pastor. Most churches give something for traveling expenses and take a free will offering each night. We sell nothing and solicit nothing. What about meals and accommodations? Our needs for food and lodging require no special attention. Motel accommodations can be simple and are preferred. But certainly not demanded. I do need time for study, prayer and rest and have found it generally best to be in a motel. If I am alone without my family and will stay in a home, there must be no embarrassing circumstances such a being alone with teenage girls while the parents are at work or alone while the husband is not there. There is too much for the devil to use against evangelists and preachers these days and we must be on guard. How does a church arrange a meeting? It works out best to either phone me or send me mail. What type of meetings do you hold? Conferences, Youth Camps/Retreats, Tent Meetings, Men's Conferences and Special Events or days a church may have. How long are your meetings and what days do you hold them? The length of a meeting is best determined by the Pastor. After all he knows the need of his people better than I do. Therefore I have no set structure for the days of a meeting. Some choose a Sunday-Wednesday, Wednesday-Sunday, Friday-Sunday, Sunday to Friday and even Sunday to Sunday. Any other combination the Pastor feels is best for his church can be worked out. Even a one day meeting is fine. Do you have a CD or Video Ministry? I have no CDs, Videos or Literature for sale. 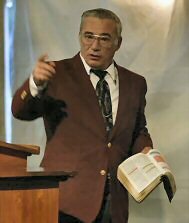 I do not sell or promote anything in my meetings except the preaching of the Word of God and the ministry of the local church. I am there to promote the Gospel, not myself or my ministry. I do not criticize others who may sell and promote their materials in churches. My focus is on the local church hosting the meeting and their ministry and needs. I do not promote my ministry or build a mailing list.